keep it to yourself in the fridge. If you don’t have fresh, frozen peas and beans will do. Adjust the cooking time accordingly. You need a food processor for this recipe. Cook the peas and beans in boiling water until softened enough, about three to five minutes. Drain them, cool them, drain again. Add the garlic to the four tablespoons of oil in a pan and cook ever so gently for about three minutes – you don’t want it to brown. Set aside in a jug, whatever, to cool. Put the peas, beans and most of the zest, keep a little in reserve, into a food processor and mix, slowly adding in the garlic oil, then the garlic cloves, most of the lemon juice, again keeping a little in reserve, and finally one tablespoon of extra virgin olive oil, sea salt, freshly ground black pepper and the remaining lemon juice to taste. Put the humous into a bowl and drizzle on the rest of the extra virgin olive oil. 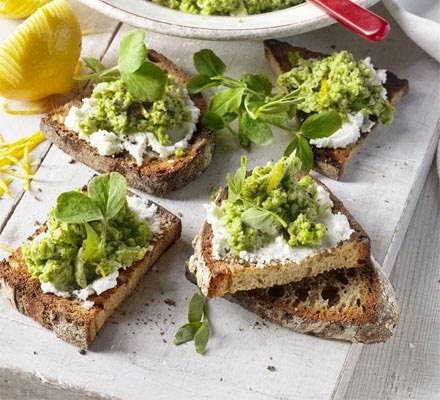 Toast the bread, spread on goat’s cheese and top with the humous, a little olive oil, some zest and black pepper if you wish and garnish with the watercress.